Recently, I was looking for gymnastics classes for my own preschool-aged daughters. As you can imagine, I have a high standard for what I look for in a preschool program, so I visited a lot of gyms. I saw some good programs and some not so good ones, but one in particular stuck out. The lobby was dirty, informational handouts were out of date, and the preschool area had motivational posters tacked to the wall. I’m willing to overlook a few issues, but the motivational posters bugged me the most. I love to be motivated as much as the next lady, but in a preschool gymnastics area? No thanks. Because those posters aren’t age appropriate for the children being served in those areas, I assumed the staff did not know much about preschool age children, let alone how to teach them how to do a cartwheel. Despite my negative first impression, I stuck around to watch the classes. Surprisingly, the coach was upbeat and energetic and the gymnasts looked like they were having fun! Still, I still didn’t enroll my kids there. Something about the place just didn’t feel right. But having a feeling about a program isn’t enough to base my decision on...is it? This experience got me wondering about what was really going on beneath the surface. A 2013 Psychology Today article about the influence of emotion on our buying decisions points out that, “fMRI neuro-imagery shows that when evaluating brands, consumers primarily use emotions (personal feelings and experiences) rather than information (brand attributes, features, and facts)” to make purchasing decisions. Taken together, you can assume that the way your preschool program looks to a new parent or gymnast the first time they see it has a huge impact on whether they’ll choose to enroll with you. What colors have you painted the walls? What condition are you mats in? How clean is your space? I’ve been in a lot of gyms - many around the world - and I’ve seen a lot of mistakes in the way some gyms create (or fail to create) a top notch preschool area. 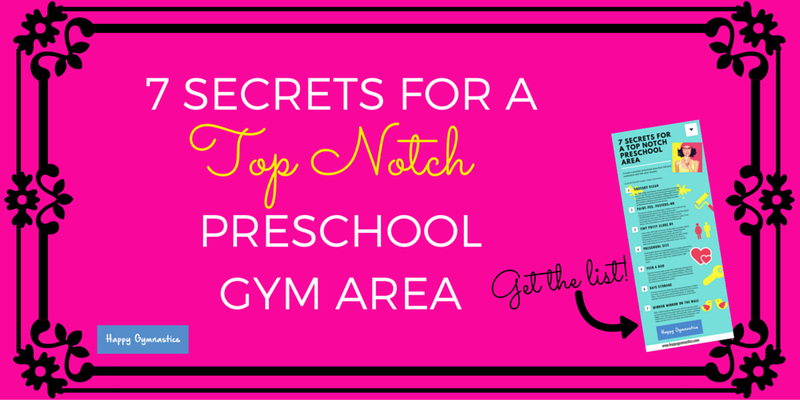 These gyms could vastly improve their preschool areas with super easy fixes, to get big results and attract ideal customers. On the flip side, the premier programs with high enrollment I’ve both created and visited, had a few things in common. So what’s all this mean for your preschool area? It means that to fill your classes, the research tells us parents need to feel positive about it before they’re willing to enroll their children. To help you make your preschool area first rate, download the 7 Secrets (I’ve tested and used!) to Create a Top Notch Preschool Area. Most are super simple fixes that you can start tomorrow.